Hemp necklace making switches gears with this switch knot necklace pattern. I was so pleased to find a way to use this primitive looking copper swirl pendant. It was a left over from a previous jewelry experiment. 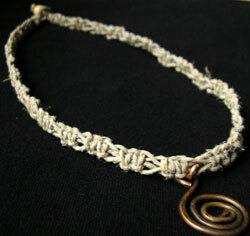 I think it works nicely with the organic "roughness" of the natural hemp twine. For beginners: Before attempting this hemp necklace making project, it might be a good idea start with the spiral necklace and the hemp bracelet with beads to get a good grounding in the basic knots. Although not difficult, this necklace and its sliding clasp might be confusing to newbies. If you're a quick study though, by all means, skip the others and try your hand at this one! Step 1 : Cut two 5 foot lengths of twine. Step 2: Make the loop side of a switch knot clasp by laying folding one length of twine over the other (leave the second unfolded) (Fig. 1). Step 3 : Use the crosswise cord as your knotters. The fold cord will be your fillers. Make 2 SK's around your fillers (Fig.s 2, 3, 4). These knots will be your sliding closure. Give it a test slide by grasping the knots with your forefinger and thumb, and holding the loop with your other hand. You should be able to slide the knots up and down the filler cords. Step 4 : Slide the knots you just made up so that the loop is small (see Fig. 5). Step 5: Make a switch knot (Fig.s 6, 7) about a thumb's width in size (see Fig. 7), securing with an SK (Fig. 8). Step 6 : Determine how long you want your necklace to be, then follow this pattern: 1 SW, 2 SK, until your work measures 1/2 your finished necklace measurement. Step 8 : Continue the 1 SW, 2 SK pattern until your necklace measures the desired length. Step 9 : Using all 4 cords, tie a tight OH close to the last SK. Step 10 : Try to fit the cords through the hole of your closure bead. If your bead doesn't fit onto all 4 cords do the following. Cut 1 or 2 cords off close to the knot and dab some glue onto it. Don't cut off more than 2 because your bead closure will be too flimsy to last for long. Step 11 : Slide your closure bead onto your remaining cords. Leave a little slack on the cords, and tie an OH using all remaining cords.(Fig. 10). Step 12 : Dab some glue on the end knot and trim. Let dry. To close the necklace, slip the bead through your thumb's width-sized switch knot. Slide the first 2 SK's away from the end loop (the first loop you made) to close securely. The roughness of the hemp cord should be enough to keep it from slipping open again. Alternatively, you can slip the bead through the first loop instead. Now you can check that off the To-do list. Hemp necklace making. Done!